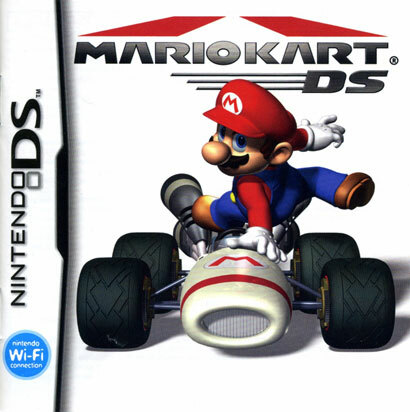 Four days ago, on Tuesday, Mario Kart DS came out. It’s a brand new game for the Nintendo DS. It’s the latest entry in the Mario Kart series. It’s the reason I bought my DS, and I’m so glad I did. I absolutely love it. It’s in my bag, back pocket, or hand everywhere I go. I don’t want to write a full review of the game. Those of you who might be convinced to buy the system and/or the game will know where to look to find more information about it, so I don’t need to be redundant. I just want to mention one thing about it: wireless. This is the first Nintendo DS game that is able to use a common wireless router (the kind you find in many homes and most businesses) to communicate with other DS systems all over the world. If I want to find someone to race against right now, I can do that without even standing up and leaving my couch. No matter what time it is. It’s a blast! Due to the way the game is written, the races are always exciting, with an anything-can-happen vibe to them. The person currently in last place is almost as likely to win as the person currently in first. It even has an automatic feature that matches you with people who are approximately at your skill level. It’s worked pretty well for me so far. If you prefer to race with people you actually know, the game has a special “friends-only” search mode. Each copy of the game has a unique 12-digit “friend code” that identifies you. 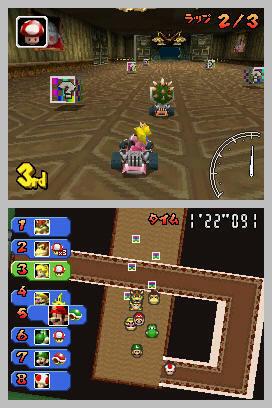 Giving it to your friends allows them to find you online and race you more easily. And of course, if you’re all sitting around a table together, there’s a short-range wireless function too, so you can play without needing a wireless access point. 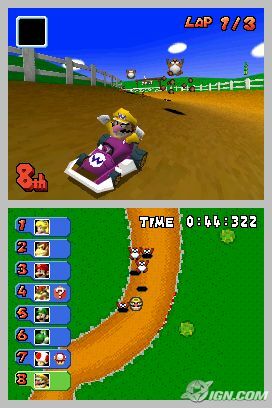 I’ve just gotten to know a few other DS owners at Apple, and yesterday we got together and played Kart during lunch in the lobby of Infinite Loop 1. It was easily the most fun I’ve had with my DS ever. It’s awesome to see everyone get hit with a lightning bolt at the same time, and hear “Awwwwww!! !” simultaneously from four different people. Or hear people gasp as a person in the back hits their stride, gets a great item, and bashes their way to first place. Today, I even considered taking it with me to the bathroom and playing in a stall with the sound turned down. I mean, I knew I was going to be in there for a little while, so why not, right? Then I realized that people in the stalls around me would occasionally hear me making frustrated little sounds. “Aw!”, “Ooo!” or “Crap!” To which the clever person in the stall next to me would probably respond, “Well, what did you expect?” I thought of this while sitting there in the bathroom (without the game, as my better judgement dictated) and I began to laugh out loud. So I can’t imagine that what actually happened sounded any better or more normal than what I was thinking could happen. Oh well. Be sure to report back with your friend number if you ever get online!